Things to do with kids in Harlem: Spring Festival on West 120th Street May 3 | HarlemGal Inc. 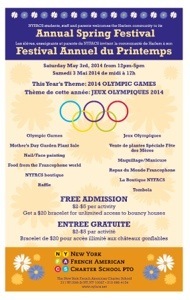 The New York French American Charter School is hosting their annual Spring event open to the Harlem community this Saturday, May 3. The street festival will offer food from around the world, two bouncy houses, games, and a plant sale. Proceeds from the spring event will benefit programming at the school. See details below. This entry was posted in Community, entertainment, Events, Free!, Harlem, Harlem bloggers, Harlem blogs, HarlemGal, kids, Things to do in Harlem, Things to do with kids in Harlem and tagged Harlem, things to do with kids, things to do with kids in harlem. Bookmark the permalink.